♥ ♥ ♥ TUKRU LOVES YOU. ♥ ♥ ♥: GIRL TALK. new dress, originally uploaded by Tukru Loves You. the other day, i randomly walked into new look the other day, had quick look in the sale rack and found this dress. it didn't have a price tag at all, so i went to the till and asked how much it was after trying it on. the girl had no way of checking so she went to the sale rack to see if there was anything similar there. she found one dress that was somewhat similar that was £15 so she said i could have it for the same price. i wasn't sure if it was worth it but i bought it anyway, despite being a bit skint. what do you think, is it a keeper? i thought if i keep it, i'm gonna spruce it up a bit. add some lace on the arm ruffles and wear it with a massive brooch cos the top half is a bit plain. and yeah, i added the big red bow belt, it doesn't come with that. i love the bottom half, but is it worth £15 / $22? the bottom half should look so fluffy with the spring wind. not sure i am into it. i would have to see it without the belt. with the belt, i feel like the proportions are really weird/potentially unflattering & OMG it is so short. i feel like it's the kind of thing that i'd think is cute on the hanger, but not on me, being thirty & post-pubescent. but if you like it, that's what matters. 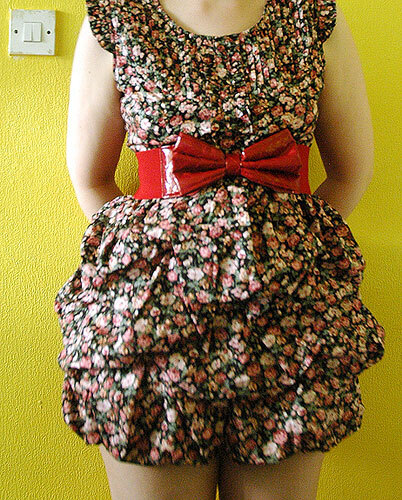 i personally don't think the top needs any more ruffles/lace, but a brooch could be really cute. If you can spruce it up, I think it's totally worth it. The bottom half is a complete win for me.